I had an incredibly busy and fun weekend - girlfriends came over for afternoon tea, we had lots of fun babysitting our one year old niece overnight for the first time (hello, 6am Sunday morning - I didn't know you existed), went to see the Building and Home Improvement show at the exhibition building and a family dinner Sunday night. Before my friends came over on Saturday for afternoon tea, I whipped up a batch of what is possibly the most delicious cake/slice treat ever. They're called Blondies, and they are the opposite of Brownies. I first had these Blondies at a good friend's cellar tea in February. They were made by the bride-to-be's sister, and she very kindly emailed me the recipe during the week so I could add it to my recipe file. I've made them a couple of times since then and they never fail to impress people - they're soft, moist and full of a delicious mix of flavours. 2. Grease 23cm sqaure cake pan/brownie tin. 3. Melt the butter and 200g of the chocolate over a saucepan of boiling water, stirring until it's melted and smooth. Remove from heat and let it cool for a couple of minutes until it's warm rather than boiling hot. The mixture will appear to separate as it cools, but this isn't an issue, so don't worry too much about it. 4. Combine sugar, eggs, sifted flours, additional 100g of white chocolate, raspberries and macadamia nuts in a bowl. Pour the melted butter/chocolate into the bowl and mix it all together until just comined. The raspberries will break apart as you mix it, but that's fine. 5. Spread mixture evenly into the greased cake tin and make sure the surface is fairly evenly flat all over. Bang the tin on the bench once or twice to remove any air bubbles. 6. Bake in moderate oven for about 30 to 40 minutes (or until firm and just cooked the whole way through). Set aside to cool completely. 7. Remove from cake tin and cut into sqaures or triangles. Dust with icing sugar before serving. 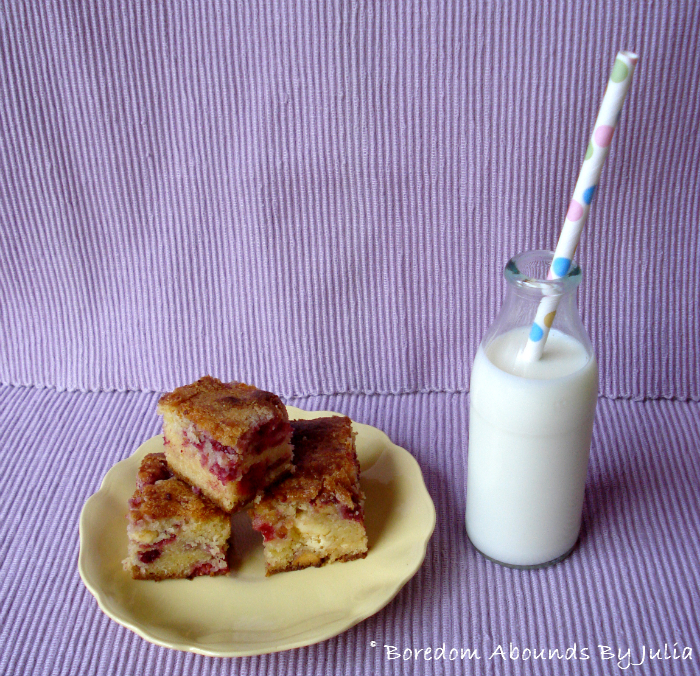 The Blondies have a lovely sweet and tart flavour, thanks to the mix of white chocolate and raspberry, which is absolutely divine. 8. Store in an air tight container once cooled and cut up - the Blondies will keep for about four days or so. - As I have a fan forced oven that gets extremely hot very quickly, I cooked mine at about 140°C for about 45 minutes. Basically, I cooked it at a lower temperature for longer. I would probably lower the temp to about 130°C next time and cook it for about 50 minutes because the top and bottom cooked too quickly, while the middle took a while to bake properly. - It's super important to melt chocolate in a saucepan over another saucepan of boiling water. The first time I made these I didn't, and while the butter melted fine, the chocolate got too hot and melted with quite a gritty texture. It was still usable, but it's really better to get it melted down as smoothly as possible. This applies to most reciped that call for melted chocolate. - The macadamia nuts are optional and don't need to be included. I have left them out and the texture of the finished product is still great. - This recipe is best served the day you make them as they're lovely and soft when they're first cut up, but serving them a day later is also fine as the density increases and they take on a subtle, fudgy texture which is also delicious. - The mini milk bottle and the straw in my photo are both from The Little Big Company, a fabulous Australian party accessory supplier. I'm obsessed with nearly everything on their website. And they have an awesome blog with heaps of inspiration and style ideas! Yeah, raspeberry and white chocolate is one of my favourite flavour mixes - definitely give it a try, because the sweetness and tartness are the perfect mix!